1) Take the length of German wire and begin to make an approx. 6mm wide wrapped loop a little further down the wire than you normally would do (bend approx. 1-1/2" to 2" from the wire end). Before closing and wrapping the loop secure, attach the loop onto an end link on the rolo chain. Now, proceed with your wrapped loop, only this time (unlike the rest of the time) you're going to try to double back and wrap back over your wraps. This will make the wrapping look wider and compensate for the difference in width between the wire and the chain. You can make this look messy or neat but try to wrap as much as you can and then snap off any part that is considered excess. Slide the Apatite nugget onto the wire. 2) With the Apatite nugget pushed all the way up to the wrapped loop that you just did, make another wrapped loop with the remaining wire (you should have approx. 2" to 2-1/2" of wire left to do this) You'll repeat the same step like what you did in step #1 -- attaching the loop to the other free end of the chain before you begin to wrap the wire. Wrap all the way down and then wrap back up just like you did before. 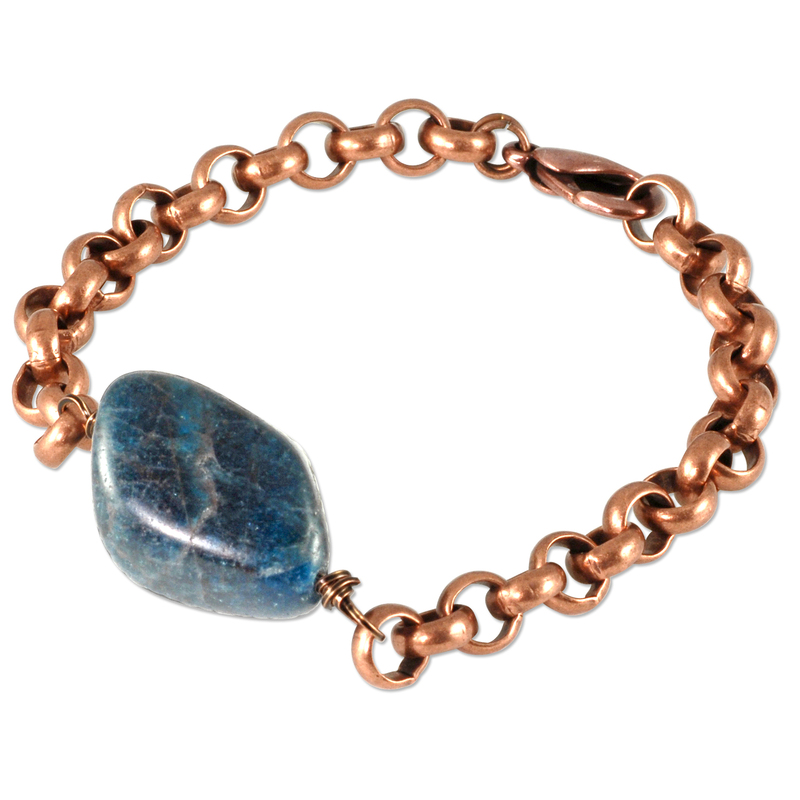 3) Hold the bracelet up by the Apatite nugget. Wrap the bracelet around your wrist and make sure that it's a good fit (if some links need to be trimmed away to tighten the bracelet up, take a mental note of how many you'd like to remove before proceeding). Notice how there in one link on the chain that is somewhat center? Snip off the link either to the left or to the right of this one. Open the two jump rings and use these to attach the Lobster claw clasp to the shorter length of chain. Done!